Life Every Day: It's Complicated. A surprising number of friends have asked me about the status of our bird's health- meaning- is he dead yet? 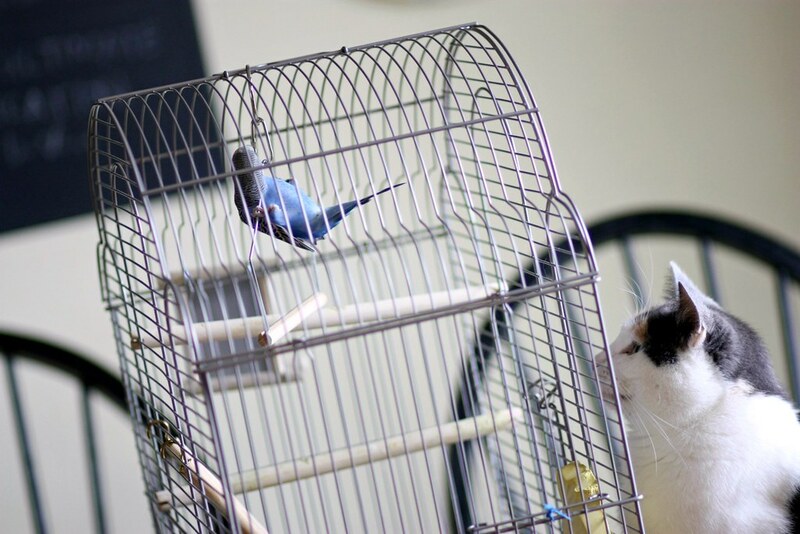 Actually, the cats and the bird have a very affectionate relationship. Blu loves to nibble their whiskers, and gets a kick out of singing, chirping, and swinging for the cats; he can tell they are wild for it. 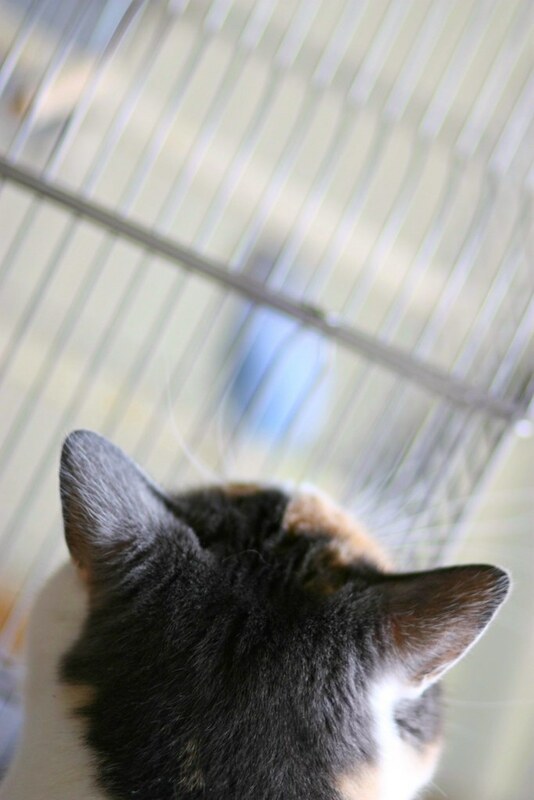 The worst they do is squeeeeeze their noses and impotent de-clawed paws between the bars to get just a little closer. As I said, Blu loves that. Sometimes they'll sit on top of the cage (when Blu isn't hanging up high.) Penney has pulled out a couple of his tail feathers, but she was provoked. Blu didn't seem to mind. No, we never allow Blu to be outside of the cage with the cats (or the dogs.) They are cats, after all. We respect the food chain and clearly Blu is at the bottom. Essentially, they have a very "Edward and Bella" relationship. 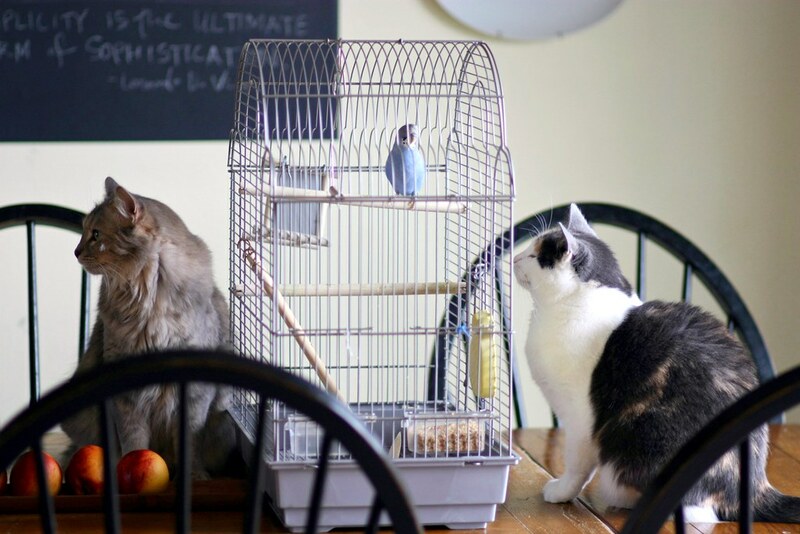 They love each other and desperately want to be together but, let's face it, as long as that bird is alive there is a chance something can go terribly wrong.